If you can't tell why you should vist the Trem Angle part of the Tech section. The trem is angled far forward and I'm not close to tune yet. 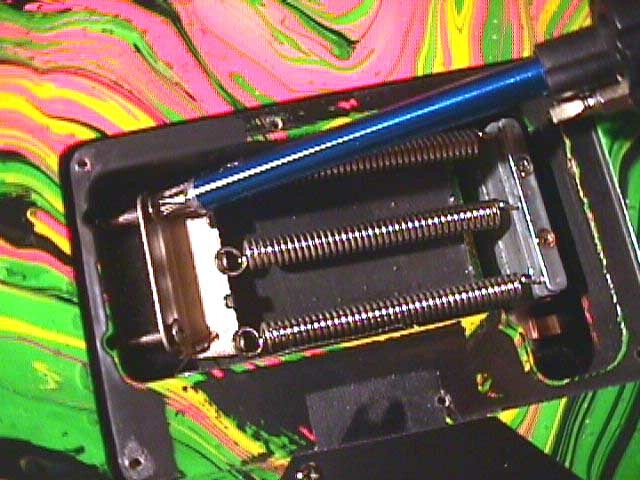 One quick look inside the trem cavity tells me the claw is way too far out. 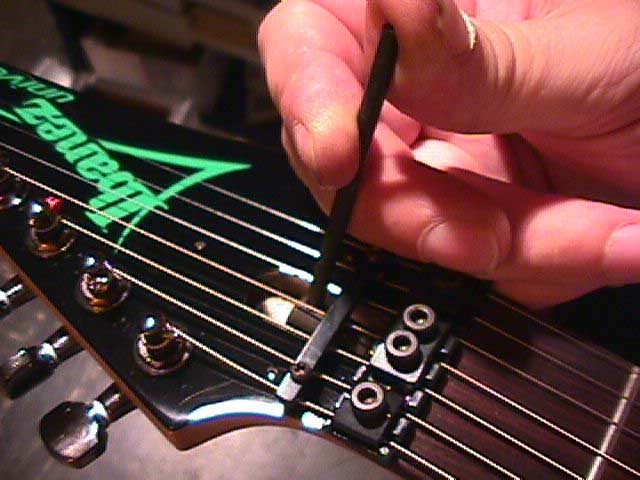 Screw the claw in to add enough string tension for 009's. I'll eyeball this in to about where I know it should be. This is normally where it should be with a .009 setup. 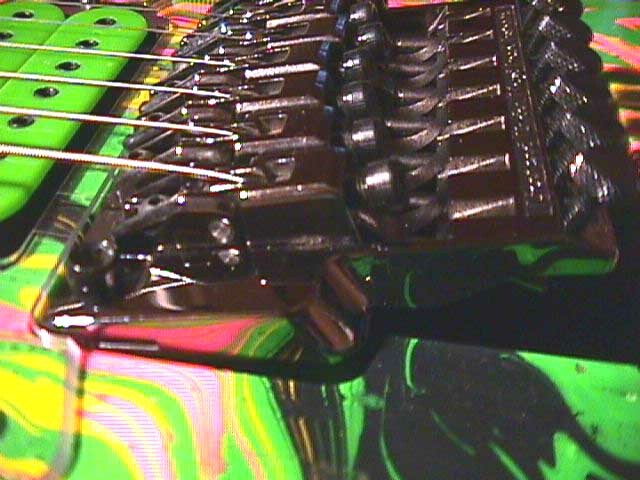 After getting the strings in perfect tune could you believe the angle was perfect, I never touched the claw again! ;-) Check out that knife edge. Where's the knife edge? You didn't visit the Tech Section did you? Time to clean the nut pads and get them back on the nut, do not tighten yet. 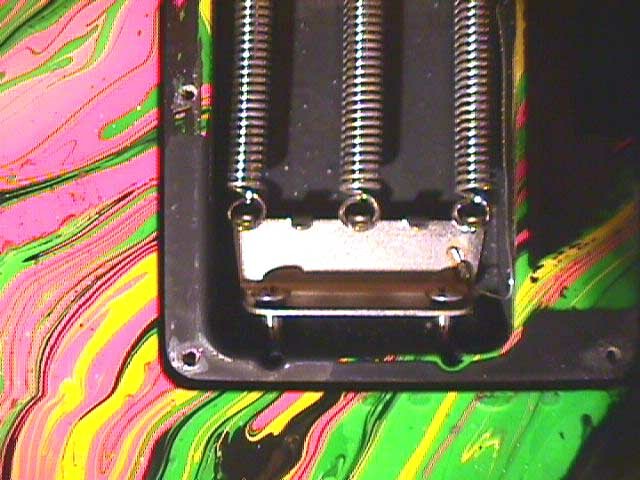 A huge part of a double locking trem keeping tune is stretching in the strings. 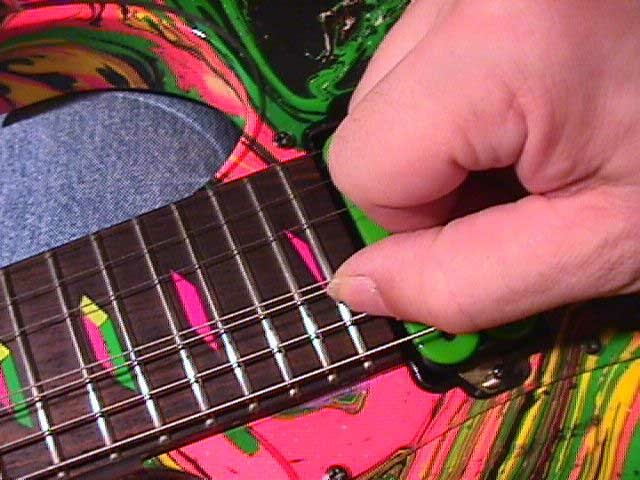 Just grab the string around the end of the fretboard and yank it back and forth with vigor! 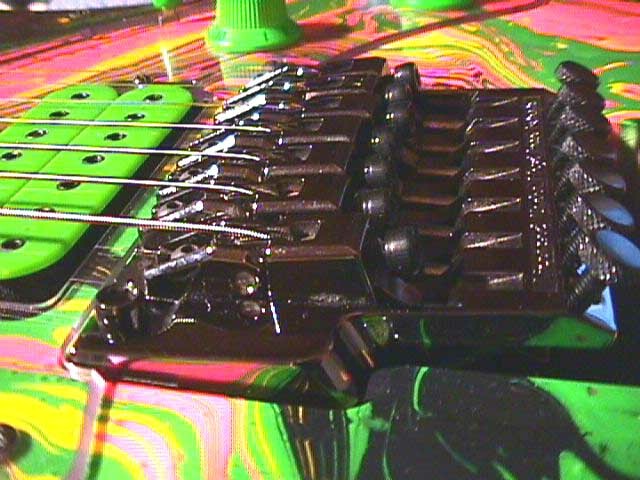 I'll usually work the string from nut to bridge from around the 9th fret to the pickups, and back again. The high E you have to be 'delicate' with but it won't stretch much anyway. The bigger the string the more it will stretch and they need to be stretched hard until you can stretch them good 2 times in a row with miniscule change in tune. Have fun with the low B! LOL I pull harder than shown, I just can't do it and take a picture at the same time. This neck has a little more bow than I like, and it's very smooth even bow down the whole neck, both trebble and bass sides, a little more on the bass. I'll give the truss a few 1/4 turns and see what happens. Just slightly straighter but as I figured, it starts to backbow from the 3rd to the nut, this neck is destined to the bow it has. This isn't a problem, it's just not *perfect*. Guitar necks will take on many different personalities and you need to adjust them to play as well as that neck will. Minor inconsistencies can be taken care of with fretwork. 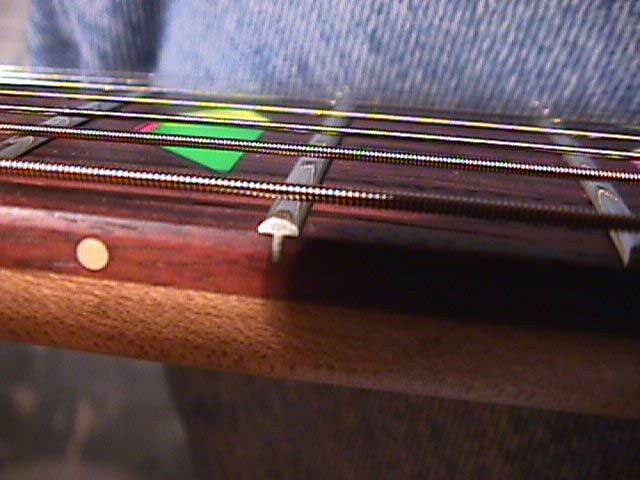 I checked to see if any serious fretwork would be needed as that would be done before the board was polished. 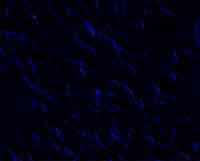 That way you clean all the fret dust, which can be considerable, out of the woods pores with the steel wool when you polish the board. I'm moving on to the action.